Nu är programmet klart för DX- & Contest-mötet 2018 i Åbo. Organisatörerna meddelar att man utökat anmälningstiden till sista januari! Så det är bara att slå till. Ta med några kompisar och åk till Åbo! Många har anmält att man kommer till Åbo redan på fredagen och arrangörerna har nu bokat Terrace Restaurant så att alla som vill kan träffas och umgås redan på fredagen. Programmet är nu uppdaterat, se nedan. Boka och anmäl dig till mötet på OHDXF hemsida. Tips: Om du åker båt, kolla om rederiet har bra paketpris på hotel Caribia. Klicka på bilden för att läsa hela programmet! 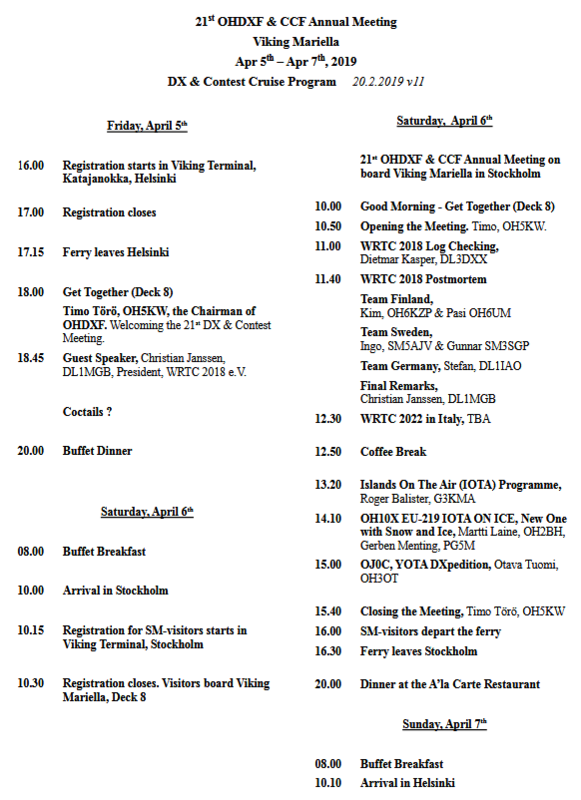 The Annual OHDXF & CCF Meeting will be this year in Turku, Finland on 9 – 11 March 2018. The organizer is OHDXF. The meeting will be held in the Holiday Club’s Caribia resort which is located just two kilometers from the City Center. The actual meeting day is Saturday, the 10 th of March. OHDXF has reserved the auditorium for the whole day. The Meeting package includes a morning coffee or breakfast, a buffet lunch and afternoon coffee. We will also have a common dinner but due to practical reasons, the dinner is not included in the Meeting package but rather charged individually by the resort. We are putting together a most interesting program. Year 2018 will be a big year in contesting due to the WRTC 2018 in Germany, thus we certainly will put an emphasis there. But since the year will start with the most expensive ever DXpedition, Bouvet Island 2018, we just must highlight it as well. These meeting have always been twofold between Contesting and DX’ing. We are working to tie the presentations into a common thread, the Theme of the Meeting. This all will come out along with the detailed program. The fee of the Meeting package will be 75 euros to all with the exception of those who stay overnight in Caribia the Friday night. Their fee will be 67 euros since the breakfast is included in the room charge. OHDXF will charge the fee during the booking. The Saturday night dinner’s package price will be 35 to 47 euros depending which menu we will choose. Holiday Club wants all participants to have the same menu, or buffet. On Sunday all participants who desire are invited to visit OH0X contest site. Depending of how many of us joins the visit we may rent a bus or just use own cars. You should reserve 6 – 7 hours for the trip. The room charges are reasonable. A single room will cost 108 euros, a double room 128 euros and a triple room 168 euros per night including breakfast. Holiday Club offers 10 % discount of all their Spa services on Saturday. The link here will introduce you to the resort. https://www.holidayclubresorts.com/en/resorts/caribia/. Turku has excellent train, bus, ferry and flight connections especially domestically and from Stockholm. We will advise soon of these. Stay tuned. More information will come up to OHDXF and CCF home pages later this week. We should be able to open booking with detailed instructions within a week. Contest University Finland 2017 is celebrating the centenary of Finland’s independence. The 2nd CTU Finland will be organized in conjunction with the SRAL Summer Camp at Mustiala Manor on Friday 7.7.2017 klo 09:00 … 17:00 local time.